New technology allows operators more precision when it comes to placing their seed and fertilizer quickly. 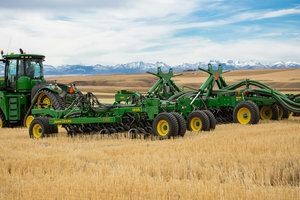 John Deere has announced the new 60-foot 1895 No-Till Air Seeder, which was specially designed to help producers plant more acres quickly and accurately out in the field. The machine is 40 percent wider than other 1895 Air Seeders and has new technologies for optimal seed and fertilizer placement. Some of the new features of the 60-foot 1895 No-Till Air Seeder include the TruSet™ in-cab downforce pressure control, ProSeries™ Openers, and RelativeFlow™ blockage warning system. With the TruSet closed-loop downforce pressure control system, operators can rest assured that their seed and fertilizer is being precisely placed across the field. The RelativeFlow Blockage Monitoring System gives operators more accurate seeding performance information in the field. "This wider no-till air drill is a perfect fit for producers looking to cover more acres faster with greater precision and improved monitoring of seed and fertilizer placement," says Emily Klemmer, seeding product manager for John Deere. "The 1895 is built on a heavy-duty tool bar for years of reliable operation under tough field conditions and is compatible with 430- and 550-bushel 1910 Carts, as well as the C850 Air Cart, plus twin NH₃ wagons." Finally, the 1895 No-Till Air Seeder has a floating front hitch, wings with 25 degrees of flex, and a larger, high-floatation mainframe with wing tires that are placed inside the high-clearance frame. For more information on all of the features of the 60-foot 1895 No-Till Air Seeder, contact your local John Deere dealer or visit www.JohnDeere.com/ag.